WXXI invites you to its third Community Cinema event, a free monthly screening series featuring films from the Emmy Award-winning PBS series Independent Lens. On Tuesday, April 27 at 7 p.m. WXXI will present its third of four Community Cinema screenings, The Horse Boy, a film by Michel Orion Scott. How far would you travel to heal someone you love? For one Texas couple, it means a spiritual journey halfway around the world to Mongolia. When their son is diagnosed with autism, they seek the best treatments but nothing works… Until they discover their son’s connection to horses and the effect it has on him. Part travel adventure and shamanic quest, this is the story of how one family found a gateway into understanding their son’s life. The screening was held at WXXI's Studios and followed by a panel discussion. Stephen B. Sulkes, M.D., who is Professor of Pediatrics at Golisano Children's Hospital and Director of Stong Center for Developmental Disabilities. Jonathan Friedlander, President and CEO, EquiCenter, Inc. The television broadcast of The Horse Boy airs Tuesday, May 11 at 10 p.m. on WXXI-TV (DT21.1/cable 1011 & 11). Submitted by Donna Fancher (not verified) on Wed, 05/12/2010 - 5:18pm. How wonderful that this family had the intuition and love to go all the way for their son. It was an honor to witness the journey. I have always felt that some answers are there if you follow your heart. Thank You for this heartwarming story. It is good to see how they were blessed with a healing by the Shamin. What blessed people the Mongolians are. Gentle and very wise. The movie did not specify where their ranch is. Central Texas is all it said if I'm not misstaken. I would like to see this movie played again, I plan to spread the word of your movie. Thank you for making it and God Bless you all. Wonderful Spirits you are. 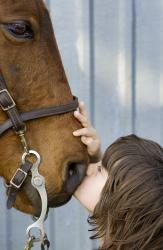 THE HORSE BOY is inspirational - a must-see! Submitted by Asha P (not verified) on Fri, 05/07/2010 - 11:01am. THE HORSE BOY is extremely inspirational - seeing the world through autism and how significantly interaction with horses has improved Rowan's fits is something short of miraculous. If you liked the film, it is now out on DVD from Zeitgeist Films. If you didn't get a chance to check it out, consider saving it to your Netflix or Blockbuster queue!